In this post, I included photos of my re-organized scrapbook area. Reader Crafter727 noticed the white storage cubes I have and asked about them – if they were the ones sold by Oriental Trading Company and how the quality is. The organizational cubes are sold in the Oriental Trading catalog. They are made by Crop In Style/Store In Style. However, I got mine one by one at Michaels using 40% and 50% off coupons and think that is the way to go. I just looked on Oriental Trading website and the plain cube sells for $28 plus shipping. At Mike’s with the coupon, I paid $15-18 and no shipping of course. As for the quality, it is very good, just make sure to line things up well and tighten the screws when you assemble them. Then they will be very sturdy. They also give you stabilizer brackets you can screw into the back to keep the entire unit safe from toppling over.. I recommend the cubes and plan to get more. Btw, Target sells similar cubes but the dimensions are different and no coupons, so they cost more. I’ve seen the Target cubes and feel they aren’t as good quality but others who have them say they are just as good at the Store in Style cubes. I use the 1-Drawer Cube to store all my adhesives. I have the Drawer Divider inside. It’s perfect for all those boxes of sticky dots, vellum tape, and random glue sticks. I have one cube with a door where I put a bunch of mini albums and little projects I’ve made at CKUs. The Filer Cube has my non-themed paper by color. As you can see in the photo, I use the other cubes just plain or with the Inserts to store albums, projects in progress, page refills, etc. Thanks for posting all these great questions – you give me ideas what to write about! These look really handy Erika. Especially to one with the shelves. 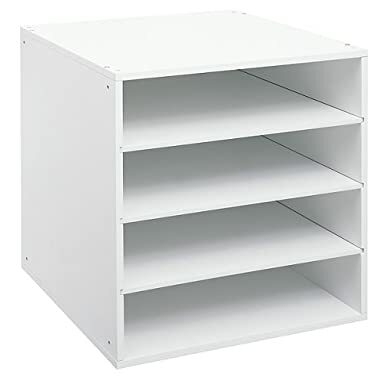 It’s really difficult to find 12×12 shelving in Australia tha tis reasonably priced. Thanks for the info. I just bought one of the target ones (one with shelves) and was looking for a cheaper alternative since I needed more to finish up my craft space. I’ll have to watch for coupons and check Micheals out. Hi bakinbit – You’re welcome :) The Target cubes are very similar and I think a lot of people use them together. Hi Karen – I feel for you. Seems like everything scrapbook related is harder to find and more expensive over there, huh? Do you know how to get a hold of this company? Our idiot movers lost almost all the pegs the hold the boxes on top of each other. Already tried Lowes for replacements. They said they had never seen those types of pegs before. I looked at Micheal’s and they had a different brand other than the crop in store (which I already have a few and want to add to my expanding scrapbooking stuff) I can’t find the crop in store anywhere except Orential trading and they are too $$.